As the temperature drops down, I am craving for more warm, sweet and tasty breakfast. 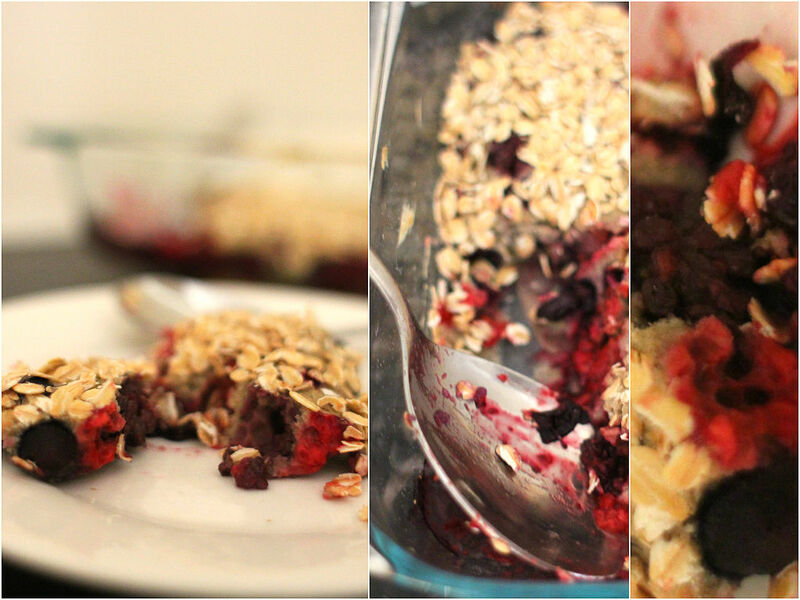 I don’t normally eat or make crumbles but felt like making one this morning out of the blue. I know it is more of a summery dessert with cream or ice cream on top, but mine is healthier, tastier and I think it is perfect for cold mornings. To top it off, I added a drizzle of Canadian pure maple syrup that my brother-in-law got me after his awesome trip to Canada. Beautiful caramel-like yet light sweetness goes really well with berries. Coconut flour is made by drying and grinding the meat of a coconut. It is full of fibre and protein, leaving you full for longer and stable blood sugar level. It is also naturally gluten free, giving you no inflammatory allergy reaction to your body. It can be a bit tricky though because if you replace normal flour with coconut flour 100%, it will be crumbly and dense. I’ve been there and don’t want to be there again >.< I also find different brands have different texture and water content. So you need to experiment, control the amount of the liquid going into the batter and mix with other flours like almond flour, oat flour, buckwheat flour, etc. Toss berries in spices and maple syrup in a large bowl. Transfer to a baking dish. Mix all crumble ingredients and make a crumbly dough with your hands. Pour the mixture over the fruits and bake in the preheated oven (200) for 20-30 minutes or until golden on top. Serve warm with thick natural yogurt and maple syrup.